Excellent 2 bedroom apartment on the second floor with park and bay views. Value for money along with park and bay views are just some of the attractions on offer in this spacious two bedroom, 3 bathroom apartment with approx. 775 sq. ft. of floor space. 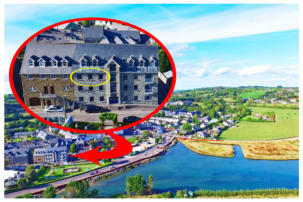 It is located just off the Clonakilty bypass and within a short walk of the town centre, it also enjoys a southerly aspect. It has been built to a high standard and finished in natural stone, the common area is clean and bright and clearly very well maintained. It would be the perfect first home for a young buyer, but it would be equally attractive as an investment property due to the extremely strong rental market that currently exists. With 775 sq. ft. this is a large apartment and certainly feels spacious when you walkthrough. Services: Mains water, mains sewage, electric central heating and there is high speed broadband available.